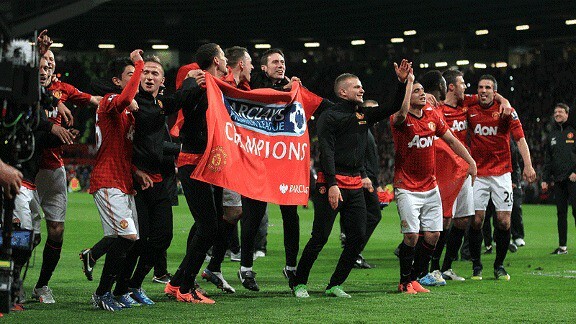 Manchester United are champions yet again! Manchester United won their 20th title on Monday night (early morning Malaysian time) after beating Aston Villa 3-0, thanks to a Robin van Persie hattrick. Earlier on Sunday, Manchester City lost to a spirited performance by Spurs, meaning United's 16 point advantage is now unassailable. It was a joy to watch in anticipation. The thing about United is that, every time they lose grip on the trophy to their rivals, they bounce back quickly in the next campaign. If you missed the match, this is Robin van Persie's wonder goal against Aston Villa, one that is worthy of a goal of the season. A stunning strike by the Dutchman - even if you are not a United fan, this is one that is worth watching. Click on the image to watch it in Hi-Definition.